Rear-End Accidents Are Among the Most Common, But that Doesn't Mean You Should Get a Common Rear End Accident Attorney. A rear-end accident is one where a driver of a vehicle does not stop their vehicle and hits the vehicle directly in front of them. According to the National Highway Safety Administration, 28% of all automobile accidents are rear-end accidents. Every year, about 1.7 million drivers cause rear-end accidents. This results in about 17,000 deaths and half a million injuries. And although it's true that most rear-end accidents are the fault of the person behind, that's not always true. To help you determine fault, you should talk to a knowledgeable rear-end accident attorney. Initially, a police officer will determine fault and write a citation to the at-fault party. However, their conclusions are only preliminary (unless you just pay the ticket), and can easily be challenged with evidence at traffic court. But a police officer's findings are not determinative in a civil case where a victim is claiming injuries. Although an insurance adjuster will give weight (often undue weight) to the officer's findings, the adjuster's conclusions aren't conclusive either (and they're definitely not neutral or unbiased). Ultimately, a rear-end accident attorney can give you a pretty good idea how the question of fault would be resolved, but the ultimate authority on the matter is going to be either the judge or the jury. That's why it's important to have a skillful rear-end accident attorney—so you'll be successful in a rear-end collision lawsuit. What kind of injuries are caused by rear-end collisions? The most common injuries from a rear-end collision are spinal injuries, but you could also suffer from burns, broken bones, traumatic brain injury, and death, among others. Spinal injuries like whiplash don't show up on an x-ray but can nonetheless seriously interfere with your life and be long-lasting. A whiplash injury results from forces acting on your body in a way that your head and body are pulled and twisted apart from one another, resulting in stretched and torn muscles and ligaments in your neck. who pays for damages in a rear-end collision? The at-fault party is legally responsible to pay for your injuries and other losses. That's usually going to be the vehicle behind yours, or if there is a long string of vehicles, it's usually the one in the very back or the one that made contact first. We usually give the insurance company of the at-fault driver in a rear-end accident an opportunity to make things right voluntarily through informal negotiations. But often we have to resort to a rear-end collision lawsuit, which is sometimes the only way to force the at-fault driver's insurance company to do what is right. Because as much as they want to hang on to their money, they can't ignore a judgment or verdict. 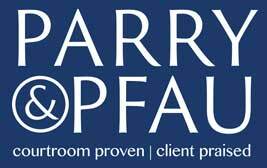 At Parry & Pfau, we are experienced in all aspects of a rear-end accident case, all the way through a jury's verdict. We'd love to talk to you and give you our free advice through a complimentary and confidential consultation. And you'll never pay us out of pocket. We make the at-fault driver pay us.